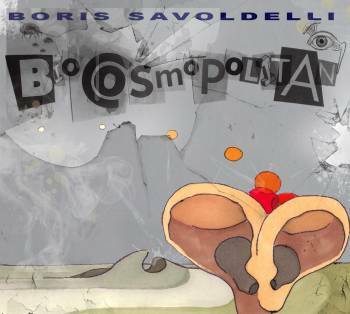 At a first glance, Boris Savoldelli’s second solo album does not spell ‘progressive rock’. With 14 songs (plus two bonus tracks) between 1 and 4 minutes in length, and a rather minimalistic instrumental accompaniment, Biocosmopolitan looks light years away from the lushly orchestrated productions of the flag-bearers of the genre. Moreover, even if the output of New York-based MoonJune Records (one of the few authentically forward-thinking labels in the business) is frequently placed under the used-and-abused ‘prog’ umbrella, this album displays a somewhat different approach to music-making, one that tries to offers something genuinely original rather than a more or less successful replica of Seventies modes. My first encounter with Boris Savoldelli’s music dates back from 2009, when I reviewed his solo debut, Insanology – an album that impressed me for its unique blend of elegance and uncontrived cheerfulness. It was one of those truly enjoyable discs whose apparent simplicity reveals layers of complexity with every successive listen. It is, however, not the complexity for its own sake that can be sometimes encountered in ‘standard’ progressive rock, but is rather achieved with a lightness of touch, a kind of consummate subtlety that is all too rare on the modern music scene – all accomplished with one main instrument, Savoldelli’s voice, a veritable one-man-orchestra of stunning versatility that has been compared to luminaries like Bobby McFerrin or Demetrio Stratos. Indeed, Boris Savoldelli is much more than an ordinary singer – to quote our fellow Italians PFM, he is a real maestro della voce, a master of the art of shaping his voice in ways that would sound impossible to most people, replacing most of the conventional instrumentation used in jazz and rock with an array of awe-inspiring effects whose apparently effortless nature belie the years of hard work behind it all. While most of the songs, which blend traditional and unconventional features, have a similar structure – where two or more vocal lines (both percussive and harmonic) intersect and spar with each other – as a whole Biocosmopolitan does not sound monotonous or repetitive. In my view, his unique handling of the linguistic aspects is probably the single most important factor for the album’s success. English and Italian intermingle with astounding naturalness (while on most other albums a mix of languages would sound contrived) that lends the album a truly cosmopolitan feel – with devices such as alliteration and assonance used to bolster the musical content, creating intriguing rhythms and textures. 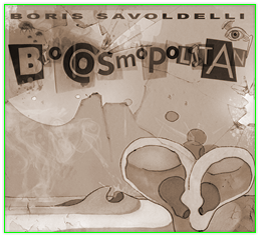 In the four years between Insanology and Biocosmopolitan, Boris Savoldelli has been quite busy, though on a more decidedly experimental level – releasing the album Protoplasmic in collaboration with Elliott Sharp, as well as three albums with avant-garde outfit S.A.D.O. While Insanology saw the presence of veteran jazz guitarist Marc Ribot on two tracks, this time Savoldelli avails himself of the collaboration of two outstanding musicians – renowned Italian trumpeter Paolo Fresu, and bassist Jimmy Haslip (of Yellowjackets fame). Haslip’s bass adds depth and interest to the title-track, complementing Savoldelli’s bluesy vocals in a song that is much more complex than it short running time would suggest. Fresu’s wistful-sounding trumpet punctuates the cheery, infectious repetition of the line “the corner is dirty” in the pause-laden “Concrete Clima” (the longest track on the album at slightly over 4 minutes), and its sudden bursts of sounds enrich the fabric of the bright, endearingly nonsensical “Kerouac in New York”. Most of the songs share the same sunny, upbeat nature and exude a genuine sense of warmth, reminding the listener of exotic vocal styles or of the sensuality of Latin rhythms, combining modernity and a charming retro feel (most evident in the Fifties’ doo-wop style of the hugely entertaining “The Miss Kiss”). Boris’s voice ranges from gritty, passionate blues tones to elegant, jazzy smoothness, infused with a genuine sense of humour and enjoyment. The only number that clearly differs from the rest is the melancholy ballad “Biocosmo”, a slow-burner (also present as a bonus track with English-language vocals) accompanied by piano and ending with solemn, choir-like chanting and distant clinking sounds, which one can almost imagine Savoldelli performing in the semi-darkness of a smoky night club. The album is then wrapped up, in cinematic fashion, by two humorous complementary pieces, “My Barry Lindon “ – basically a series of ‘thank you’, handclaps and assorted sounds with occasional vocal harmonies thrown in – and “Closin’ Theme”, where a voice recites the album’s credits in English with mock seriousness. The second bonus track, a cover of Jimi Hendrix’s “Crosstown Traffic”(already included on Insanology), is the closest the album goes to traditional rock, with Savoldelli offering a more than credible performance as a hard rock vocalist. Biocosmopolitan is one of those rare albums that are potentially appealing to all music lovers, regardless of genres and labels – though it might disappoint those who require songs to be over 10 minutes in length, or object to the lack of ‘proper’ instruments, or even shun any kind of music that is not dead serious or just plain depressing. Progressive without necessarily being ‘prog’, entertaining and at times even exhilarating, Biocosmopolitan is an ideal showcase for the amazing vocal and compositional talents of an artist whose work proves that impeccably performed music can also be fun. Very nice review. The imagination and genius of Boris Savoldelli is a breath of fresh air … I love this CD! !